This is the classical Aylesford Pit (No. 2 site of RMC) which opened pre-1851. Traditionally known as the Wagon Pit, it has a number of synonyms: Silas Wagon's Pit, Wettern Bros., Aylesford Sand [& Gravel] Co., Halls Aggregate Pit, and finally Aylesford Sand Quarry. 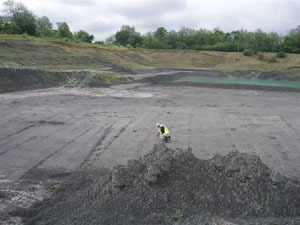 The picture left shows the main level in the quarry, approximately eight metres below the base of the overlying gravel, after excavation of 70,000 tons of clay for brick making. The pit has expanded west and north over the years, eventually crossing Bull Lane via a tunnel to produce a separate (No. 1) pit. It shows middle Medway Terrace 2 (Aylesford Gravel Formation; Late Middle/Upper Pleistocene; 200/125 Ka) on Gault and Folkestone Formation (Albian; c. 110 Ma). The relationship of the Cretaceous Formations is complicated by folding and the Gault forms small diapirs into the Aylesford Gravel Formation. The Gault ranges as high as the Calliphoplites auritus subzone (Upper Gault, equivalent to the base of the Folkestone Bed XI). The clay is fossiliferous with at least 35 species including foraminiferans, molluscs, annelids, crustaceans, bryozoa, corals, brachiopods, burrows and driftwood. The Folkestone Sands show very good indications of tidal deposition including opposed cross sets, reactivation surfaces, graded foresets, mud drapes, neap/spring bundles, sand textures and bioturbation. Together with the adjacent Aylesford Pit, the Folkestone Sands are considered to show some of the best examples of this type of facies in the UK and probably Europe. The excellent Lower Greensand sections are reported separately. The Folkestone Sands are generally unfossiliferous but have some burrows and bivalve moulds. 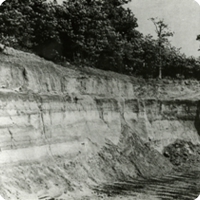 The Aylesford Gravel Formation ('50-foot' Terrace) comprises fluviatile sandy gravels with the occasional pond clay lens and clasts from local Cretaceous and Tertiary Formations. The gravel is succeeded by 'Head' (slope) deposits including 'Coombe Rock' and 'Brickearth', the latter beneath the modern soil. Nine species of large mammals are recorded representing a cool open grassland assemblage. Also, Lower - Middle Palaeolithic flint tools of Neanderthal/Heidelberg men, the earlier material reworked. The Pleistocene deposits are affected by periglacial structures such as involutions and ice-wedges. Minerals include tiny selenite crystals due to weathering of the Upper Gault. The site is an active quarry and all visits have to be properly controlled. Contact the Quarry Manager well in advance to make the necessary arrangements. Visitors will need to be properly inducted (advised of the potential hazards) and properly equipped (with boots, helmets, high-visibility clothing etc. ).